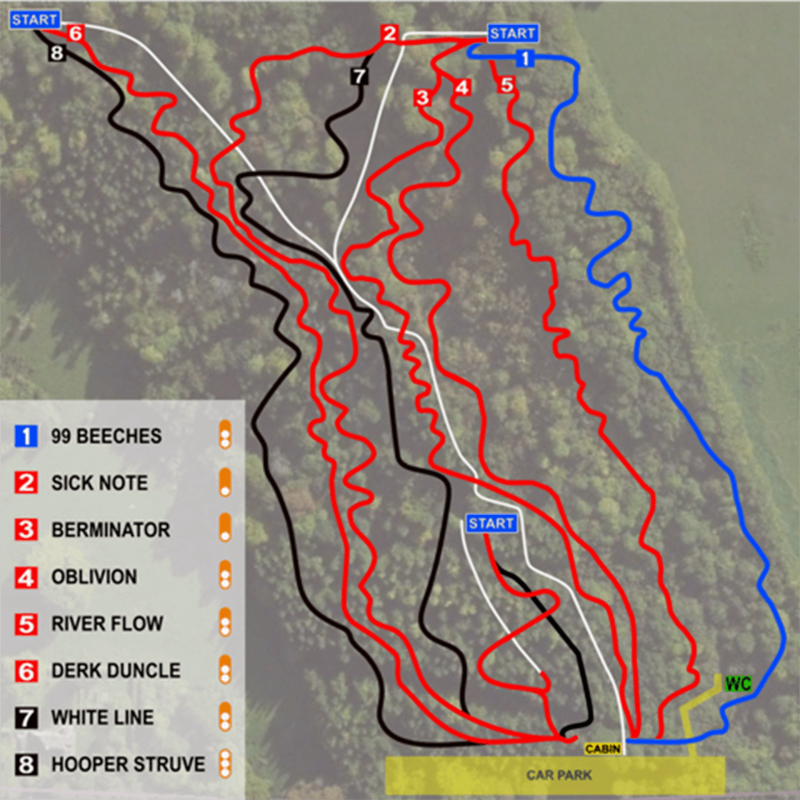 What does Tidworth Freeride B1KEPARK have to offer? Tidworth Freeride was for a long time one the South’s best kept secrets when it comes to riding spots. Now under B1KE’s management we are doing everything we can to get the word out about how good the mountain bike trails at Tidworth really are! With a range of Freeride focussed downhill trails you’d be forgiven for thinking you’d been dropped in a Bikepark in mainland Europe. The Tidworth Build Team have really made the most of the elevation and the contours of the hill to build some amazing trails. How much does it cost to ride at Tidworth Freeride B1KEPARK? To Ride at Tidworth Freeride you need to be a B1KEPARK Member, There are now 3 Membership Options. You can Register as a Free-2-Ride Member which is Free you will Pay for a £7 Day Pass on each visit. The second option is to Register as a Site Member which is a one off Fee to ride at Tidworth Freeride for 12 Months (the equivalent of 12.5 visits). Alternatively if you plan to visit our other sites why not choose Full B1KEPARK Membership and ride any of the parks anytime for a yearly cost of £125 for adults and discounted rates for Juniors, Families, Students of Active servicemen & women. Tidworth Freeride is the perfect venue for progressing your Mountain Bike Skills. With a fantastic range of Trail Features that progress from small and rollable through to large. There really is something here for everyone regardless of age and experience. There’s everything here in terms of trails, providing the ideal progression for the range of courses offered. Despite being one of the first sites of it’s kind in the South, Tidworth B1KEPARK might not be as well known as some other venues but it is rapidly building a reputation as a must ride venue. 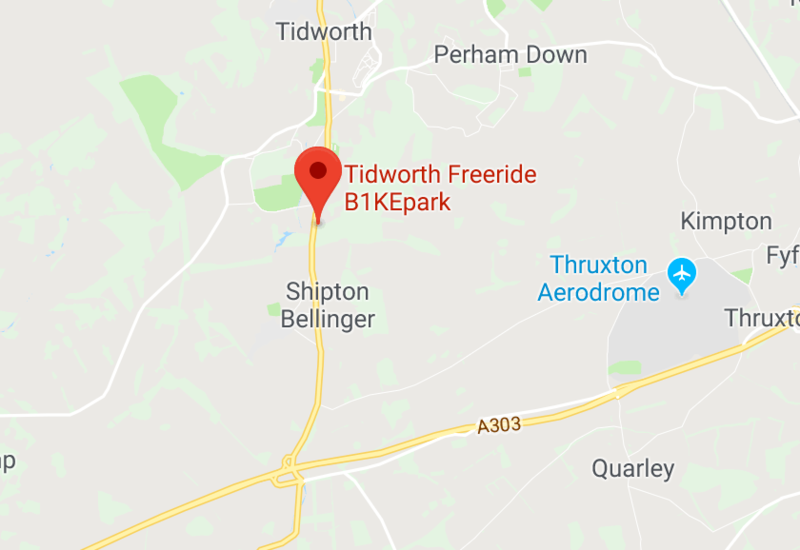 Originally built and populated by the local downhill and Freeride biking community over 13 years ago, Tidworth Freeride was the first site to join the B1KEPARK network. Since that point the site has been developed and enhanced and as with all sites is continually growing and being refined to meet the changing demands of a sport who’s boundaries continually get pushed. The site has trails for riders of all levels, whatever the style of riding. A choice of 8 Trails provides a real opportunity for riders to develop in confidence and ability, offering a graded selection of progressive tracks (with jumps, drops, berms and step downs), a Basic Skills Area and a Dirt Trail Arena ranging from small table tops to large doubles and the big features in the Parks Signature Trail, Whiteline. Whether you are a fan of technical downhill or bigger jump lines, Tidworth B1KEPARK will not disappoint. Sick note is the easier of the DH trails initially contouring across the top of the hill and then picking up pace as it begins to descend. Offering a number of rollable challenges which include rollers small table tops and a couple of steps no higher than a foot. The trail provides a variety of berms and flat corners which allow riders to develop their cornering skills. It is good introduction to gravity cycling. River flow is one of the more natural trails it requires the rider to work harder to find their flow. There are series of slightly larger drops which are not quite rollable linking some tight corners will test your ability more the faster you ride. River flow is a whtly lines at the top , winding through the sycamore saplings, which then open out on to ‘beaver dam’ and fast final straight. 99 Beeches is great place to start, particularly if you are newer to riding gravity parks and downhill. Venturing on to the far side of the site, the trail starts with natural undulations which then lead into a series of different corners forcing riders to move around their bikes to make the most of it. The trail begins to pick up a lot of speed towards the bottom on to a rollable step down then its all about keeping the speed for the final table top features. Starting in from the same point as Hooper Struve, Derk Duncle starts with a pedal into some tighter corners and close proximity with the pine trees which drop riders into the gulley before leading into a series of drops which pick up speed quickly. Contouring across the hill through a series of off camber options and roots, the trail then steps down on to a fast 25foot rolling double and a sprint through to the finishing area. A techy DH run that requires a bag full of skills to master and a great place to progress your technique. Hooper Struve is the main race line offering a number of technical challenges including flat corners rock gardens drops and doubles, this trail does require a higher level of ability to safely negotiate to the end of the line. Home of the Hooper HooHaa this trail is full on DH were the rider is responsible for finding the flow rather than haveing it served up on a silver platter. Offering a number of line options as you descend down through Mini Morzine and off the coffin drop, a flat out race to the finish over refurbished tables and rollers makes this a firm favourite long after the tapes are down, after race days. Humps and Bumps: A jump progression area made up of a series of table tops, berms and doubles perfect for a warm up or a session at the end of the day. The area is found at the bottom of the hill close to the carpark and is great for honing jumping skills. This area is also fantastic for the younger rider to gain confidence riding up and down the table tops getting to grips with standing on their pedals and the exhilaration of quick acceleration as the they descend the down slopes. The introductory freeride line on the hill offers a trail of three parts a set of varied berms and switch backs leading into ‘starwars’ part of the original General line, one of the first trails on the hill. This leads down to the iconic series of 12 switch back berms which offer the perfect training ground for mastering cornering ability whilst all the time trying to maintain speed through to the final section of rollers table tops and rolling doubles perfect for honing jumping skills. A fast fun trail that can be sessioned from various points on the hill and a mixed bag of novice/intermediate level DH and Freeride. Oblivion As the name would suggest, a roller coaster of a ride. The trail is rollable but (not really designed with keeping the wheels on the ground in mind) has some big features on it which do require a higher level of skill to overcome. It starts with a series of berms linked with step downs followed by a big step down into an equally big step up. The mid part of the trail then rattles down through the trees into a drop which links into the final section with some big jumps starting with a dual hip jump providing the option for riders to increase the air time they are getting before hitting a larger double and fast on through to the end. Recently reworked in collaboration with B1KE’s partners in grime, ‘DirtKraft’, White Line is Fun on Flow and Freeride hits. It is a series of jumps that descends pretty much straight down the hill. Starting with a fairly innocuous step up riders are straight into a couple of doubles that cannot be rolled. Which then leads into a set of progressively larger step downs. Riders need to be capable of jumping and managing themselves in the air to be able to safely ride this trail. Poppy lips and long landings offer riders of growing ability loads of progression but it isn’t for the feint heart, culminating on a long carry step down into the iconic 43ft final table and final hip to finish. A firm favourite that deserves best the praise and respect riders give it. Riders in good health with basic off-road riding skills. Basic mountain bikes. Some “single-track” sections and small obstacles of root and rock. The Lozenge grading pertains to the Technical Trail Features (TTF’s) that the trail includes. This can be Drops, Steep Chutes, Jumps (Tables or gap Jumps) Road gaps and Berms. Two Lozenge trails will contain Technical trail features of a medium to large size. A trail with a two lozenge grade MAY contain features that can not be rolled but where these are present there is always an option to by-pass them without needing to leave the ground. Three lozenge trails will include features that can not be rolled and are unavoidable. The size of features will vary from small to very large – the key point of note is that you can not opt to avoid these or roll them. Riders should be capable of, and expect to leave the ground in order to complete these trails. It’s like a mini Whistler!